Secluded Bungalow setting on 25.09 acres. House sets back off the road, circle driveway. 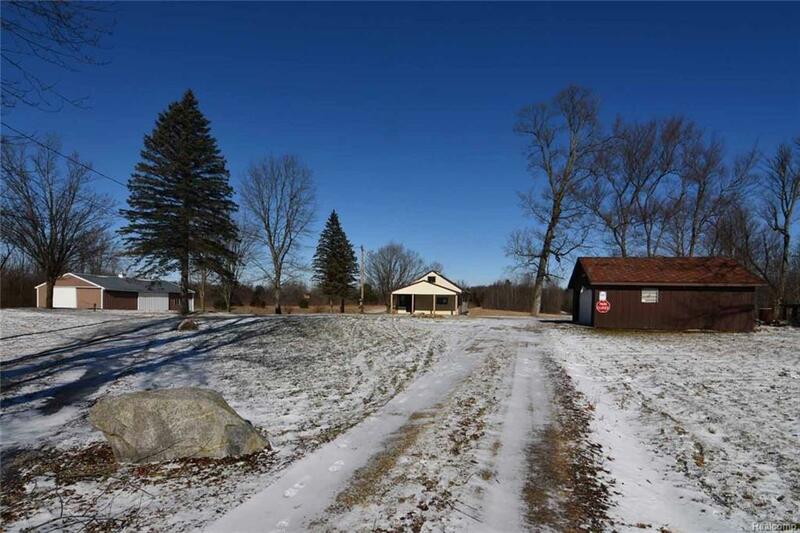 Beautifully wooded acreage with small pond, great for hunting or just enjoying nature. Several out buildings, including Detached 2 Car Garage with electric, 32 x 48 Pole Barn with electric and water, large shed. Covered front porch leads to the enclosed Foyer. Foyer French Doors enter into the Living Room. Kitchen equipped with Refrigerator, Stove, and Microwave. Large Master Bedroom on the entry level. Upper level Library/Study and Bedroom in need of some finishing touches. Mud Room off Foyer with stairs leading down to basement. Basement is unfin but has lots of potential with walk out access. Glass block windows in basement. Deck off back of the house. 2 Septic, 1 for house and 1 for RV Pad with Electric hook up. Septic hook up at street, but was not required to do so due to house distance from road. If you want some room to roam this home is for you. Highest and best by 2/15/19 at 3pm.